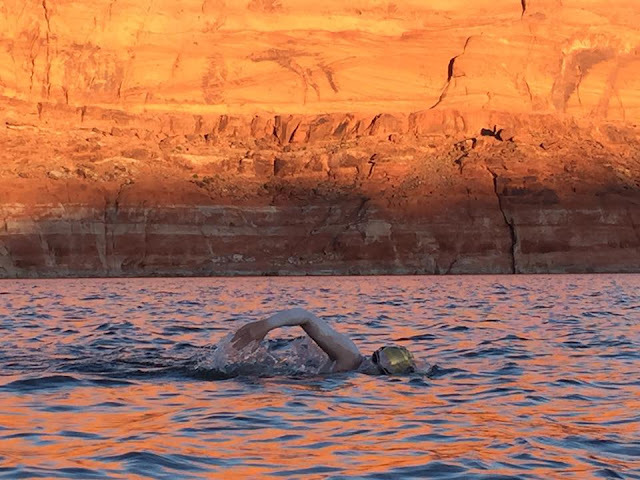 Photo of Sarah Thomas courtesy of Andrew Malinak on Lake Powell, Arizona-Utah border. Sarah Thomas's recent 81.8 mile (131.6 km) solo swim on Lake Powell has been described as iconic and inspirational, epic and intrepid. "While distance is the one parameter that the media and the swimming community has focused on, and rightly so, I think the selection of Lake Powell - and the creativity of her course - were really brilliant decisions on her part," reflected Steven Munatones. "The Night Train Swimmers opened up the possibility of ultra marathon swimming in Lake Powell in 2010 with their Mexican American Unity Swim relay of 108 nautical miles (200 km) over 55 hours 20 minutes. Sarah took it to its next logical stage. Other than the professional marathon races that are the chosen open water discipline of young fast competitive swimmers, the globe remains very much entirely unexplored from the perspective of open water swimmers and their support crews. Some athletes like Lynne Cox and Lewis Pugh focus on extreme swims. Others like Ram Barkai and Christof Wandratsch focus on competitive ice swimming. Others like John Kinsella and Angela Maurer focus on pro marathon racing. Others like Martin Strel focus on long stage swims in rivers or in channels like Thane Williams. Many others like checking swims off their bucket list of open water swims like the Triple Crown of Open Water Swimming or the Oceans Seven. Others like Doug McConnel or Jim Dreyer focus on charity swims. The sense of adventure, creativity and risk come to a physical, mental, operational and logistical culmination when identifying, planning and attempting an unprecedented swim of any distance in an unchartered body of water whether it is swimming across or around or between two points of land." Take a globe or explore Google Earth and look for something - create something, organize something - that has never been done before. Be the first and enter your name in the annals of open water swimming forever. That is what many swimmers are increasingly attempting as the world begins to get swum like never before. Like Sarah Thomas in Lake Powell.